What is a 'Send Task'? Usually business processes are linked and some depend on others. Once the Recruitment process is completed, the Induction and Training process begins. Upon completion of a sale, the Invoicing process has to be launched. And like these, there are many more examples. The advantage of modeling processes independently and interconnecting them is that you can measure them separately. You can know exactly how long it takes to complete each one and get individual metrics. In addition, the modeling is simplified, as each process becomes smaller. By automating this connection, you avoid possible human errors (delays, forgetfulness, etc.). 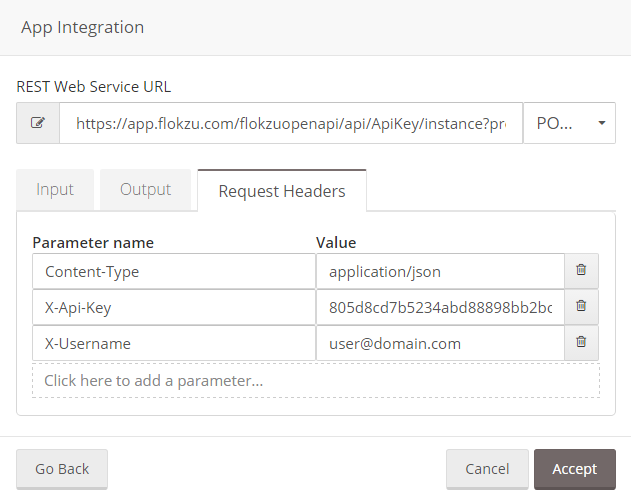 In Flokzu it is possible to launch one process from another automatically and even use data from the source process to send it to the destination process. If after the Recruitment process you have the employee’s info, you can launch the Induction process without having to re-enter the data manually. 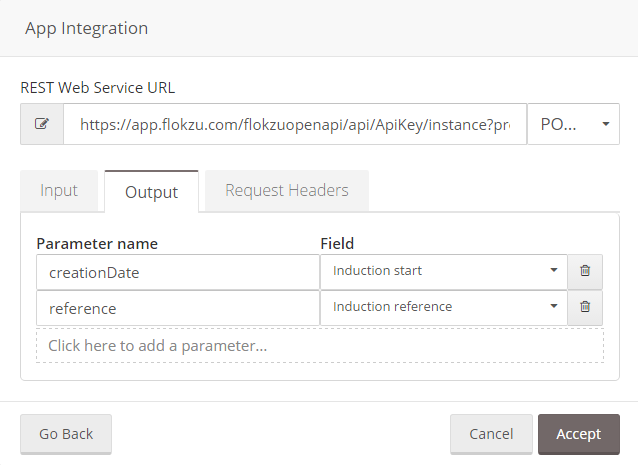 Keep in mind that you won&apos;t be able to link processes during your trial of Flokzu. Once you subscribe to any of our Service Plans, you&apos;ll be able to link processes at any stage of the workflow. In the source process, drag and drop a Service Task at any stage of the workflow. When the process instance goes through that task, it will automatically launch the destination process. 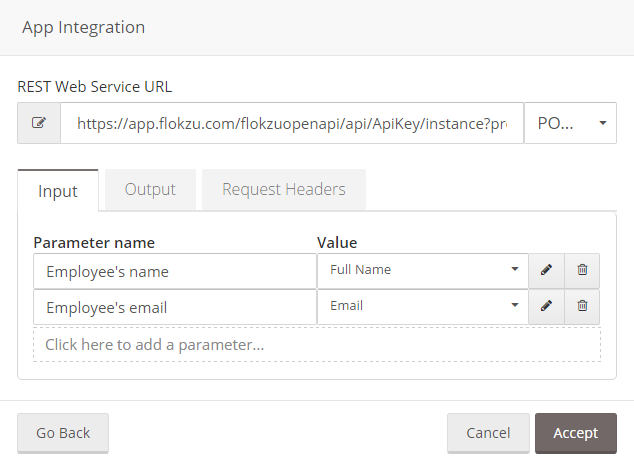 Replace ApiKey with your organization’s API Key (you can generate and copy it from the section Configuration> Advanced visible only to Administrators). Replace ProcessID with the ID of the process you want to launch. The method must be POST. Input (optional): here you must configure the fields that you will send from the source process to the destination process. The parameter name must match the name of the field in the destination process where the information will be saved. The value must be the field of the source process you want to send. Output (optional): here you must add the fields that you will send from the destination process to the source process. You can send the creation date and the reference of the created instance. As the parameter name you can enter creationDate or reference. In value you must indicate in which fields of the source process that information will be saved. Once this set up is completed, you can automatically launch one process from another. You can even launch several processes at different stages of the workflow. For example, if the candidate is selected, the Induction process must be started, but if he is not, the Notify Rejection process must be launched. You can make as many combinations as you want to facilitate your work and automate the management of your organization. In the Input, make sure you have written the names of the fields from the child process correctly. Otherwise, the values that you want to send to the child process won&apos;t be mapped in their respective fields. Use the same data type for fields copied from one process to another. This is essential if you want to modify the field in the child process. If you want to use the values as read-only, you can use a text type field in child instances and you&apos;ll be able to see the visible value. In case you use different data types for the fields in the father and the child processes, make sure that the fields have, at least, the same bound value, e.g. If the bound value of a field named &apos;Analyst&apos;, with &apos;Federico&apos; as value, is &apos;1&apos;, but for the data type defined in the child process, the bound value is not &apos;1&apos;, then the mapping won&apos;t work. For this reason, we recommend to use the same data type for fields related in different processes.